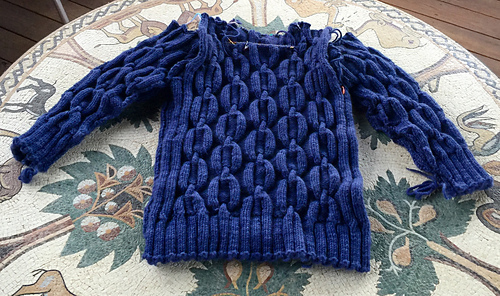 Finished after much delay, with huge thanks to fascine, who did the seaming for me. 2-6: The sleeves were absolutely depressingly huge. A number of other people have commented that the sleeve seem to be written in a very wide style. I’ve ripped out my sleeves and started over again. 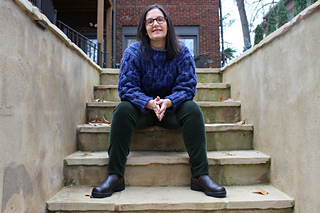 I am using M1 increases in the cuffs when the stitch being increased is part of the group of stitches working, but when it’s time to switch from a knit to a purl vice versa, I am doing the increase by making a backwards loop and then knitting or purling, through the back loop when necessary. 12-8: picked this back up after knitting a few other things and started the sleeves, two at a time. Wow! These things are huge 20 rows in. Need to decide whether to frog back or just quit increasing. How will that affect the armholes and setting in the sleeves? 9-28: Ripped out the ribbing. Going back to the original stitch count. I’ll start the front for Plucktober. Also bemoaning the fact that I didn’t use a tubular cast on for the back. The pattern doesn’t call for it, but it does look so much better. I would make that small change if I had this to do over, probably using the version Michelle Wang uses. 9-1: cast on 5 extra stitches on the front to give a little extra room in the ribbing. Will need to reduce them before starting the cable pattern. 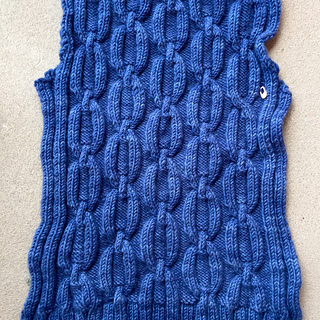 8-5: after debating not doing the full amount, I completed the 18 rows of ribbing the pattern calls for. For reference, I’m getting off 22 rows to 4 inches instead of the 20 the pattern calls for. 16 rows divided by 5.5 = 2.9”. 18 rows divided by 5 = 3.6”. Note for when you get to the sleeves. 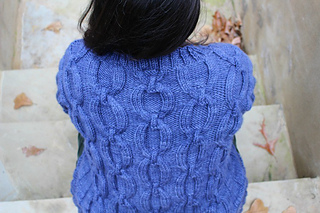 The pattern calls for you to do increases and to “take the increased stitches into” either the rib or the cable pattern. This advice from CablingKaren: Yes, when you increase during the rib you start adding stitches at the outside for the rib. For example, if you are working the rib as k1, p1 at the beginning and increase a stitch you will then work it as p1, k1, p1 from the beginning and so on. 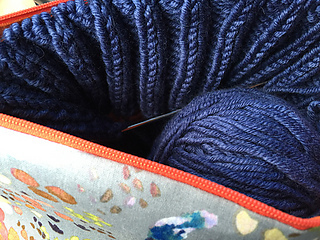 I don’t have the Glacier pattern in front of me but when you add stitches into the pattern the same applies. For example, if you are working the pattern as p3, k6, p3 and so on, when you add a stitch at the beginning the first one will be a k1 to make it k1, p3, k6 and the second one will make it k2, p3, k6 and so on. Once you have k6, p3, k6 etc. you will add 3 purl stitches. I emphasise this in only an example - I don’t have the pattern in front of me. You will only be able to work the cable when you have sufficient stitches to do so. Work the ones you have at the edges in stocking stitch until you have enough to work the cable. 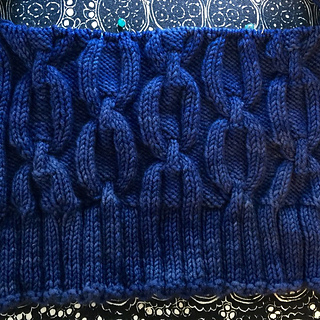 Based on my gauge and the recommendations on the Rowan board that indicate the patterns run large, I’m knitting the size small for my 36” bust. 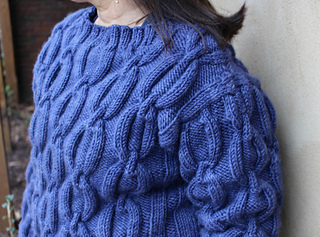 But I'm going to rib on the same size needles I'm knitting with to accommodate my hips, size size 7 all around. there is a reason patterns direct you to do this. I had to rip out and redo the rib on needles two sizes smaller, as directed. For Knitting the 9 Stitch Cable: knit stitches 9, 8, 7. Your center 3 stitches are the ones closest to your left needle, (6, 5, 4, as you slipped them on to the cable needle). You are still holding the 3 they were 3, 2, 1 as you slipped them on to cable needle. In other words: Step one is to move the last 3 sts all the way over to the right. Step three is to move the first 3 sts all the way over to the left. 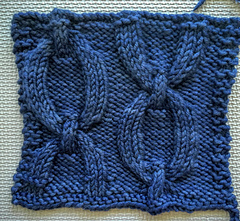 Gauge: Gauge in unblocked swatch, knit on size 7 Darn Pretty Needles: row is 20.9 st = 4” and stitch is 23.25 over 4”. With a little luck, this will block out just right, as I prefer this fabric to the size 8 swatch. And it did. My stitch gauge is perfect. Row gauge is off - I’m getting 22 rows instead of 20 to 4”, which is perfect because I’m short and need to have less length. Swatching on size 8 needles, Rough math: if the gauge on my swatch holds up the way it’s looking, I will get four stitches an inch instead of 5 1/4. That means I could knit the extra small to get the medium. For the medium that cast on 125, divided by five is 25 inches. For the extra small, cast on 103, divided by four is a couple of inches smaller and should be perfect. 9/1: ready for shoulder shaping on the back. I stopped around 20cm in stretched, 22 cm lightly stretched, ready to start a row 17 with 5 full ovals plus a partial in each row.